We inadvertently named our two children names that have loose connections to birds. Minerva is the goddess of wisdom, often represented by an owl. Odette is the white swan in Swan Lake. I’m expecting our third child. If it’s a boy there is a family name already on tap. 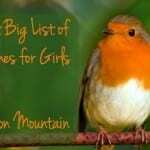 If it’s a girl I’d like to continue with bird names. The only name I’ve found that I like is Meadowlark. I first heard of it when the basketball player died. (Note from Abby: what an amazing! name. Here’s a little more about the basketball player.) My husband thinks of it as a boy name and doesn’t really like it. He also thinks it’s too clunky. Besides it is a bird and not bird-related like the other names. How do I even look up names that are connected to birds but not birds themselves? Tall order I know. What a fun accidental theme! And you’ve chosen such great names for your daughters. This one proved tough to research. And yet, all you need is a plausible connection to a bird, so that’s much more flexible than trying to choose an actual bird name. Appeal to many. Owls and swans both claim positive associations. Pair well with Minerva and Odette. Rank low on the popularity charts. After all, Minevera and Odette qualify as relatively rare. I’ll start with my best suggestions, but I know readers will have some great ideas, too. Adelie – Names like Amelie and Elodie feel vaguely French but easily accessible in English. Adelie gives me pause because it’s easily misheard as Natalie. And yet it’s a gorgeous name! The Adelie penguin lives on the Antarctic coast. They’re named for Adelie Dumont d’Urville, wife of French explorer Jacques Dumont d’Urville, who first encountered the Adelie penguins. One other concern: Adelie and Odette share similar sounds. Lina – I searched for books about birds, and stumbled on a 1955 Newberry Medal winner called The Wheel on the School. I’ve never read it, but there’s something intriguing about the plot. A group of children work to bring storks back to their village. Too obscure? Maybe, but Minerva, Odette and Lina match nicely. One other thought: Carolina, as in the Carolina Wren. Except that feels a little too literal! Luscinia – Pliny the Elder used the word luscinia to refer to nightingales and their cousins way back in the first century AD. It remains part of the scientific name for nightingales to this day. No one is using Luscinia as a given name, and yet, it sounds like it should be one, right? It would shorten nicely to Lucy and Lou, and could fit right in with Olivia and Sophia and all of those ends with -ia names for girls. Paloma – In Spanish, Paloma means dove. That tiptoes close to a literal bird name, something you’d like to avoid. And yet, it doesn’t feel like a literal bird name – unless your family speaks Spanish. 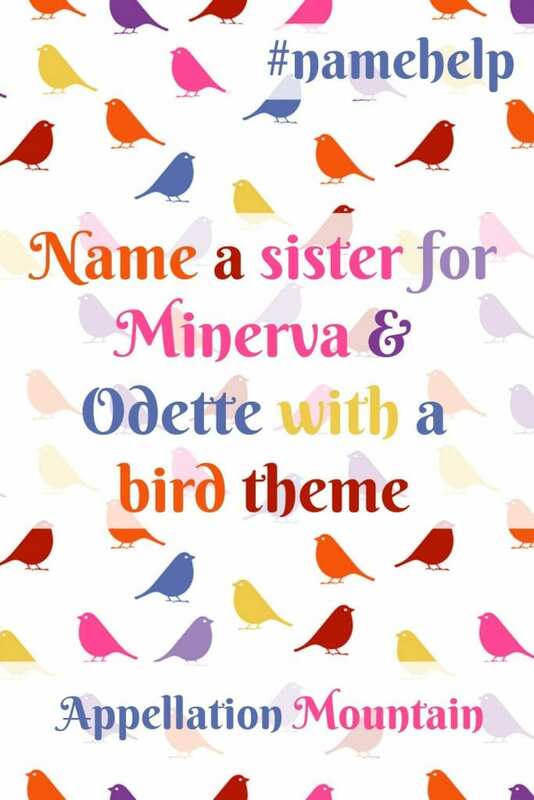 It sounds like a sister name for Minerva and Odette. Plus, doves stands up well to swans and owls in terms of symbolism. Wisdom, grace, and peace. Pavonine – Feline refers to cats, canine to dogs, and pavonine to peacocks. Like Luscinia, no one is using Pavonine as a given name. But there’s potential. Philomela – There’s a gory story of things gone very wrong behind this pretty name. In Greek myth, Philomela suffers terribly, until the gods take pity and turn her into a nightingale. Sephora – Visit any mall in America, and there’s almost certainly a Sephora selling make-up. Turns out that the name comes from the Hebrew Tzipporah – bird. No specific bird, just bird. That’s not exactly what you had in mind, which is okay, because I’m not sure if Sephora would wear well on a child today. Sibyl – Do famous birds factor into your thinking? In Bell, Book, and Candle, Mrs. De Passe’s parrot answered to Sibyl. Again, this probably feels too obscure. Overall, I think Paloma makes the strongest choice, with Luscinia and Adelie not far behind. One last thought: I combed through lists of famous ornithologists, like this one at Ranker. But nothing really stood out. Any scientists out there? Or science educators? I feel like there might be something I’ve overlooked! Let’s throw this open to everyone, because, readers, I know you’ll come up with some brilliant ideas. What are your favorite avian-inspired appellations? Side note, please let us know what the original questioner chose! Wow o wow do I love these comments! Just came from the other bird article and I’m a huge fan of a few bird names with Lark being my favorite, most usable name. Love learning of some of these correlations with other names I like to have a theme because I’ve always thought if I use Lark I don’t want to use another obvious bird name (too hippie-ish even for me)! Thank you for sharing all for all us name nerds to be together! Freya, Rhiannon, and Seraphina are my favorites, and I found a few more I like! Hi there, such intriguing name choices they are lovely together. If you want to keep the bird theme may I suggest wren? It’s simplicity with the other two works well in my opinion, other than that a name that instantly comes to mind is Swanhild other than that it would be the more obvious choices like Robin, Raven. Lots of lovely options here, I also like Irene for Irene Pepperberg for her work with Alex the parrot on language ability and cognition in birds. There’s also Hera. I don’t know if it’s too matchy matchy with Minerva. Hera’s sacred animal is the peacock. Amazing suggestions!! My votes in no particular order are for: Paloma, Lenore, Jemima, Rhea, and Isabeau. Probably Lenore I love the best. Lenore is on my list for possible future daughter. A totally gorgeous but quirky name. No one is using it. (Though sound alike Eleanor is everywhere a lot of those go by Ellie which you could not do with Lenore.) Isabeau is maybe a close second for me. I just double checked a few things on wikipedia. ‘Sialia’ is the genus name for bluebirds. Unlike most pretty yet uncommon names it flows well. There’s a few fairytales I remember from childhood that involve princesses turning into birds and whatnot. It brings to mind Melusine and Altalune. Are there any other -lune names? How bout Florence as in Florence Nightingale. She had at least one pet owl I recall. Also there’s Edith as in Edith Piaf the french singer. Piaf is some kind of bird in french, a sparrow I think…. Rhea is both a Greek Titan and a species of bird. I went to school with a girl named Rhea and always liked it. Lenore! From Edgar Allen Poe’s “The Raven”. I immediately thought of Celandine, a floral name that derives from the Ancient Greek for “swallow” (the bird). I adore the name, and I think it’s tragically neglected and unappreciated. Plus, it complements the lovely Minerva and Odette beautifully! I heartily endorse Luscinia and Philomela. Linnet is another possibility. A linnet is a type of songbird. It’s pronounced like Lin-nit, not lyn-NET. Aviana/Avianna means ‘like a bird’. I think is suits your sibset. Best wishes! Focusing on both your daughters names being a female persona who transforms to a bird…one a goddess and the other from fairy tale lore…i tried to come up with another…A more modern occurance came to mind…the movie Ladyhawke with Michelle Pfeiffer…Lady Isabeau is transformed into a hawk by an evil wizard in order to keep her from the man she loves. And really Isabeau just feels perfect with Minerva and Odette. My very first thought was Wren which I think goes so well with your other daughters’ names. I also love Lark and several others that were suggested such as Seraphina and Jemima! Also a suggestion, if you were going to go the route of Branwen which was suggested as well, you could alter it to Bronwyn which I think has a much softer sound to it. That is our daughter’s name also and I love it. Good luck with your choices! Bronwen and Branwen have different meanings, if you are looking for the bird connection. Bronwen means white breast in Welsh; Branwen means white raven. I second the choice of Seraphina (though Sarafina was how the character spelled it) or Lenore. Literary names FTW! I first found the name Zenaida while going through a field guide to birds. It’s a genus of doves! Oddette, Minerva, and Zenaida would be a super-cute set! I really like Abby’s suggestion of names associated with doves. I looked up a list of Goddess who have associations with doves. Ishtar came up. I then looked up associated names of Ishtar on Behind the Name and found Esther and Hester. Doves are also associated with Mary. So you could always choose one of the many Marian names. Additionally Meadowlarks are quite common in Native American lore, there might be some inspiration there. Larks are associated with the moon, and there are lots of moon names. Hope you you find a name you love! I’m so excited that my question was picked and am loving reading all these wonderful suggestions. Thank you Abby and everyone who has commented! Love the suggestion of Paloma as well as another name meaning dove – Jemima. Another uncommon name associated with falcons is Peregrine. App Mnt featured this name, so check out the entire write up. It may be used more for boys, but seems like it could work for both. No direct bird connection, but i like Alma for this sib set. Alma with its “soul” meaning seems to fit with the wisdom/grace concepts in the other names. Ditto the suggestions of Lenore, Freya, Vega, and Rhiannon. And, of course, going to literal translations of different birds in non-English languages leads to loads of options. I don’t have any suggestions but I think Lenore fits perfectly with what you’re going for and really works with Minerva and Odette. Good luck! Jemima Puddleduck was a Beatrix Potter character. She’s incredibly sweet. Penelope actually means ‘duck’ (or ‘weaver’). She was the queen of Ithaca and the wife of Odysseus in Homer’s The Illiad. Penelope might feel too common for your taste, but depending on where you live, maybe not. Luscinia is a marvelous suggestion by Abby! In folklore, Aquila was the name of the eagle who fetched lightning bolts for Zeus. The Nords had a goddess named Freya who was associated with falcons (much in the same way Minerva is associated with owls). Phoebe strikes me as the obvious one. Laerke is popular in Denmark, so Lark would be nice in English. Corva is derived from the term for raven. There is an NPR reporter with that first name. Branwen is a character in the Tristan and Isolde myth. I once read a novel called White Raven that had Branwen as the main character. The name means white Raven in Welsh, with bran meaning Raven and wen/win meaning white. Also Alondra, which has been popular in Puerto Rico. It means lark and is also a nickname for Alejandra. Fritha is also a possibility. She is the main character in the book The Snow Goose, about a young girl who saves a wounded snow goose in World War II Britain. The name means fair, beautiful in Anglo Saxon English. What about Jenny? Jenifer or Genevieve? The link there being Jenny wren from the nursery rhyme ‘little Jenny wren’ – it’s an old English one and quite sweet. 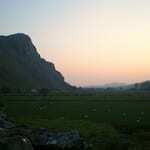 You could go for Dawn – as in dawn chorus. Or maybe Maya (Filipino for sparrow a bird that exists all over the world). Orel which is Russian for Eagle. That’s a few I can think of right now… I love love love Minerva by the way – I just read a book that was about the woman who wrote out of Africa, a tiny owl adopted her when she was alone on her coffee plantation, becoming her companion and she named it Minerva. Freya is associated with falcons. So, Minerva comes from mythology, and Odette is from a fairy tale . . .
My first thought was Lenore from The Raven. Thumbelina’s story hinges on her friendship with a lark. Obviously, you wouldn’t want to actually use Thumbelina, but I wonder if you could get somewhere from there – Lina or Belle or something like that. 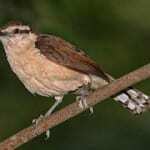 Jenny Wren is a common character in nursery rhymes. One bird name I discovered recently is Aderyn. Best suggestion I’ve heard yet! Minerva, Odette, and Lenore also sounds best as a set. What about Florence (nightingale) with the mm wren? Double bird! There’s also Maya (as in Angelou, who wrote “I Know Why the Caged Bird Sings”), although that may be too sad of an association. Athena is another goddess of wisdom, represented by an owl. Veela — from Harry Potter, are a race of magical creatures appearing as beautiful women that transform into birds. I think Veela would be a lovely name! I think your best bet is to do a search for “bird goddesses” or “bird legends” (even replace with your preferred bird! ), or “names related to [bird]” and see what names relate that you like. Good luck! This is such a lovely accidental theme, I hope you are able to continue it! Avice! Or Avis or Avicia or Avys or any of the variants. The constellation, Lyra, is often represented as a bird with a lyre. Vega is one of the brightest stars in the constellation, and comes from an Arabic word meaning “falling eagle.” Fionnuala was transformed into a swan in Irish mythology. The Welsh legend of Rhiannon has a mystical bird element. Jena means small bird in Arabic. I like Paloma the best with the sibset. How about Calliope, which is Greek like Daphne and Minerva, and means beautiful voice? Or Halcyon, Neala (cloud)? I think Minerva, Odette and Seraphina is pretty awesome. And since Seraphina is also related to angels/wings there’s sort of a subtle connection as well in case the literary one does not appeal. In fact any angelic name might work. I love Paloma and Philomela! Beautiful names that fit perfectly. Halcyon/Alcyone is another Greek myth name related to birds (kingfisher). It’s a much less violent story than Philomela’s. Halcyon is also the name of the younger sister character in The Peacock Spring by Rumer Godden. Beautiful passage about the “gentle lark” in Cymbeline. Though Cymbeline is a male name in the play, I always thought it had potential as a quirky girls name. Another character is Imogen. Then I thought of Ode to a Nightingale. John and Keats aren’t great girls names but he refers to the “viewless wings of Poesy [poetic inspiration]” Posy or Josephine (nn Posy) could be cute. Ruth and Flora are from the poem itself. I also thought of Frances, the name of Keats’ inspirational love/fiance. Finally, Emily Dickinson’s poem “hope is a thing with feathers.” Emily might be too common but you might find Hope more appealing. I appreciate the difficulty of your situation; it’s hard to hit that sweet spot that Minerva and Odette do. But your daughters have wonderful names, so I’m sure you’ll pick something fantastic! I was going to suggest Luscinia too. I believe the correct pronunciation is Lu-skin-eye-ah, but everyone will say loo-sin-eee-ah. 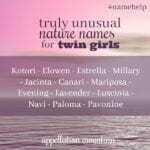 Well, there’s this (https://mamaslistofnames.wordpress.com/2017/03/21/the-ultimate-list-of-bird-baby-names/) blog post from a fairly new blog about bird-derived baby names, but it’s pretty literal and that doesn’t seem to be what you’re going for. (Also, unlike the author I would strongly caution against naming a child Albatross). You have lots of options from this post as well! Paloma, Phoebe, Celandine, Laraline would all fit!